Try finding the largest and smallest rhombus, rectangle, trapezoids etc. so their vertices include a special point and the other vertices lie on the lattice points of a grid. The first half of the video is quite easy, but the latter part is really fun and interesting. These puzzles were inspired by Don Steward’s brilliant blog. Below – students struggle through a tougher variant. Download it here. Nothing must be advanced in a positive manner. The mind of the pupil is to be the principal operator; it must instruct, convince, and confute itself; and when it arrives at some important truth or result, it must be through its own powers. It ought not even to perceive that it has been guided thither. 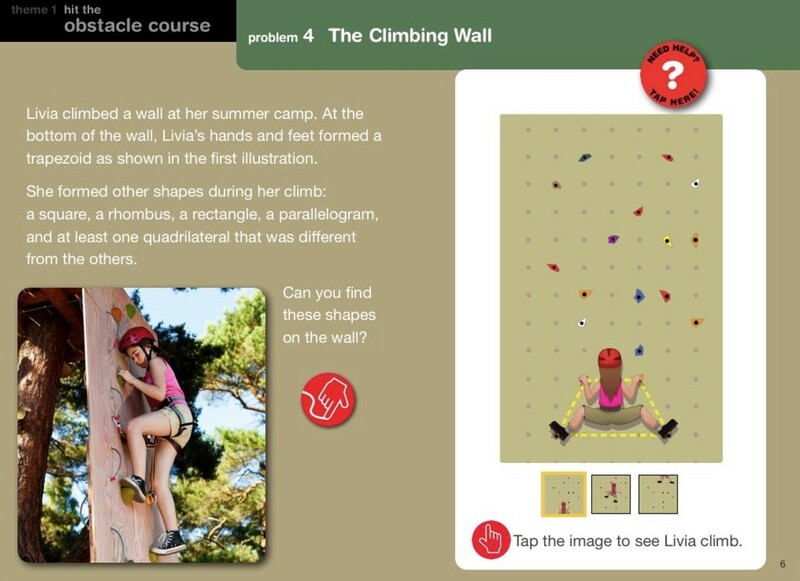 Baobab Education had a clever theme for these type of puzzles – rock climbing walls… When I redo this puzzle I will use their theme. These themes do not make the problem “real world” – no climber looks at a rock wall and sees trapezoids 😉 However themes add interest for those students who need a little bit more to get engaged. Just because the connections are silly does not mean that they are pedagogically wrong.